Many things are dyed green in honors of Saint Patrick’s day, and here we will (casually) examine the best method for turning Irish Whiskey green. Initial observation: Food coloring is obviously used to turn food and beverages green. It’s also Saint Patrick’s Day, so we wanted to experiment with the greening social phenomena. Question: What is the most effective method of achieving a pleasing green hue in an irish whiskey. 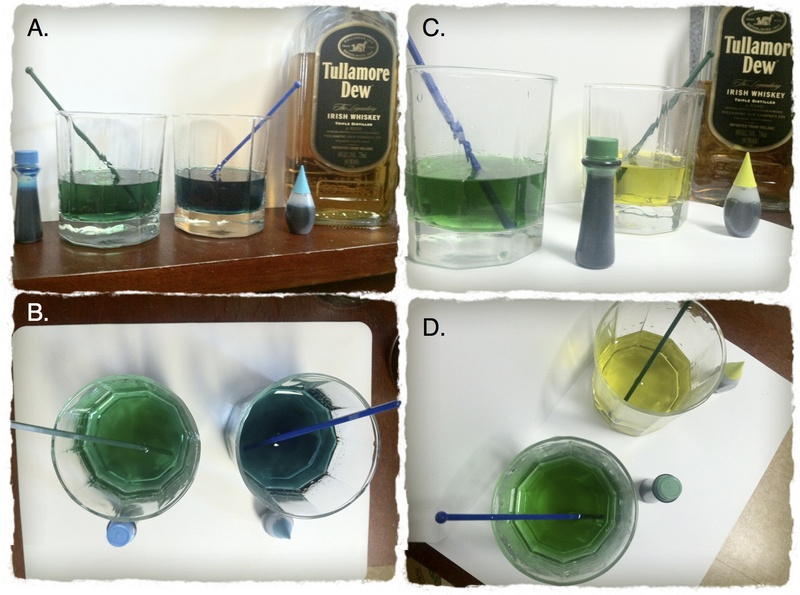 Expectation: blue food coloring seems to be the most obvious choice given the normal “yellowish” starting color of irish whiskey. enjoy, and realize that, in this case, it’s actually pretty easy being green. A single drop of (normal) blue food coloring gave a pretty decent green, but a single drop of the “neon” version created a much more teal beverage (much more on the blue side than the other food coloring). One drop of normal green food coloring gave the best result overall, and the “neon green” just made it yellow. Dropping a single drop of food coloring into the whiskey does some really neat things if you don’t agitate the glass immediately. The bulk of the food coloring drops to the bottom of the glass (density of water = 1.0 g/cc, density of 80-proof alcohol = 0.94 g/cc). In addition to that, neat tendrils (or, reverse diapirs if you will) form from the food coloring that initially spreads out along the surface of the whiskey (but then sinks due to being more dense). Despite the initial assumption that blue might be the best choice given the baseline yellow character of whiskey, the regular, run-of-the-mill green food coloring gives the best results. The neon food colors seem off in this medium, and may be designed especially for white backdrops (e.g. frosting or eggs). does a professional gel-style food color achieve a better result? what is the minimum amount of food coloring needed to get a good result? would less than a drop work?